Let an unfettered imagination sow the seeds of possibility in the rich soil of your soul. The soul's awakening is gratitude. The Soul's essence is simplicity. The Soul's serenity is harmony. The Soul's passion is beauty. The Soul's purpose is joy. The soul is not born; it does not die; it was not produced from anyone. Unborn, eternal, it is not slain, though the body is slain. The soul is dyed with the color of its thoughts. Think only on those things that are in line with your principles and can bear the light of day. The soul is a creator learning creatorship. When we have done all the work we were sent to Earth to do, we are allowed to shed our body, which imprisons our soul like a cocoon encloses the future butterfly. Your enormous soul had so many choices of who it could show up as. It chose you. Silence is the communing of the conscious soul with itself. After a 6 month hiatus, I am back to writing my newsletter articles! This month, I created an article about the Soul from my own perspective. I respect that your viewpoint may be very different however, I do hope you will enjoy the details below. The field of Western psychology is one-dimensional in that its focus is limited to individual’s present lives in the 3rd (physical) dimension. Although Western psychology is very effective in what it does cover, its shortcoming is that it does not take into account the fact that we are multi-dimensional beings. Our souls have lived multiple lives in many different dimensions. In fact, as we will explore in this article, our souls are living in multiple dimensions at this very moment. Soul psychology includes all aspects of the soul, such as past, future, and inter lives; karma; life lessons; other dimensions; spirit guides; and soul groups in order to assist clients realize their highest potential. Methods used include past life and life-between-lives therapy and working with spirit guides. Soul psychologists support clients as they work on their soul history, soul imprints, soul lessons, and soul inclinations (passions and gifts). In addition, the soul psychologist helps clients process their interactions with others in their soul sphere of influence. Animism – Everything has a soul. Buddhism - Humans have no permanent self. Anatta means no-self or no soul. Chinese – A human has two souls: an ethereal hun (spiritual soul/spirit that leaves the body after death) and a p’o (physical soul that remins with the corpse). The p’o is linked to the dead body and the grave, whereas the hún is linked to the ancestral tablet. Chinese traditions differ over the number of hun and p’o souls in a person. Taoism believes in 10 souls, sanhunqipo (3 hun and 7 p’o). Christianity – A human has a body (soma), soul (psyche), and spirit (pneuma). Egyptians – Souls reside in different parts of the body. An individual can have up to 10 souls, which include: Ren, Ka, Sheut, Ib/Ab, Sekhem, Aakhu, Khaibut, Khat, and Sahu. At death, the Ka remains in the tomb and the Ba ascends to the spiritual regions. Eskimo – A human has more than one type of soul. Some believe one is associated with respiration and the other accompanies the body as a shadow. Hawaiian - There are 3 parts of the soul: Aumakua (Superconscious Self), Uhane (Conscious Self), and Unihipili (Subconscious Self). Hinduism - There are 25 coverings wrapped on a soul: Iccha avarka, Linga deha, Avyakta sharira, Avidya avarna, Karma avarna, Kama avarna, Jeevacchadaka, Paramacchadaka, Narayana rupa avarna, Vasudeva rupa avarna, Sankarshana rupa avarna, Pradhyumna avarka, Anniruddha avarka, Anniruddha sharira, Vasudeva kavaca, Narayana kavaca, Anandamaya kosha, Vignanamaya kosha, Manomaya kosha, Vangmaya kosha, Shrotrumaya kosha, Chakshurmaya kosha, Pranamaya kosha, Annamaya kosha, and the Gross Body. Hungarian/Baltic-Finnic – Humans have a dualistic shadow-soul called Itse. Jainism - Every living being has a soul. The soul (Atman) is categorized by its liberation state. It can be Liberated (having attained Moksha) or Non-liberated (exists in either human form, in the form of another living being, in heaven, or in hell until the birth and death cycle is complete). Nefesh is the “animal soul" or "lower soul" and represents instinct and personality. At death, the Nefesh remains in the grave. Ruah is the “middle soul” and represents intellect and the conscious. At death the Ruah ascends to the terrestrial paradise in accordance with its merits. Neshamah is the spiritual portion of the soul or the “higher self”. It is the power connection to the Source. At death, the Neshamah goes back to the Divine world or Divine Mind. Plato – A human soul has 3 parts: Logos (mind, reason), Thymos (emotion, spiritedness, masculine), and Eros (desire, feminine). Q’ero of the Andes – When a human dies, their body goes to Earth, their wisdom go to the mountains, and their energy goes to the stars. Rudolf Steiner – A human has 3 stages of soul development: the Sentient Soul, the Intellectual (Mind) Soul, and the Consciousness Soul. Siberia and Mongolia – A human possesses at least 3 souls: the Suld, Ami, and Suns. Some groups, such as the Samoyed, believe there are 4 souls in women and 5 souls in men. These extra souls are not permanent, like the core 3 souls that all Siberian groups agree upon, and the extra one or two souls gradually dissipate after the death of the physical body. Our incarnated Soul, in the form of an energy body, overlays the physical body. The energy body is attached to the physical body through the chakra system. However, the incarnated Soul is only a small part of our total soul energy. The Oversoul is an intermediate level that exists between the incarnated Soul and the Higher Self. The Oversoul does not incarnate. Its function is to coordinate multiple soul journeys. For example, the soul can be having multiple experiences in different dimensions simultaneously, including parallel lives on Earth. The Oversoul keeps a bird’s eye view of all of the soul’s activities. The Higher Self is the intermediary between our Soul/Oversoul and the Source of All That Is (aka Creator, Great Spirit, God). It is the individualized essence of Source. It is called by many different names, such as: I Am Presence, I Am That I Am, Pure Being, Love, Essence of Life, Cosmic Consciousness, Universal Mind, Atman, and Monad. The Higher Self holds all knowledge and wisdom. It knows all that the Soul has ever experienced. The Higher Self is the highest point of consciousness within the Soul. It is totally and irrevocably one with the Source of All That Is. It is the source of our intuition. The Higher Self, representing the Eternal Self, is omnipresent, omnipotent, omniscient, eternal, infinite, wise, loving, light, free, and indestructible. Being holographic, the Oversoul and Higher Self are aware of all the Soul’s fragments as well as the Soul’s wholeness simultaneously. When a Soul is ready to incarnate, it works with the Oversoul, Higher Self, and its guides and mentors to create a life plan for the upcoming life. Our conscious minds are tapped into the Soul level that is incarnated on Earth. The Oversoul and Higher Self can be accessed through the subconscious or superconscious mind. Deep trance, shamanic journeying, and meditation can open these portals. Much of the communication between the Oversoul and our other Soul Parts occur while we are asleep. Sometimes, when we first awaken after sleeping, there is a period of time that bleed-through of awareness from the other dimensions can occur. By acknowledging and listening to our Higher Self, we expand our perception to view a much bigger picture than what our everyday incarnated consciousness provides. The whole of eternity is present in each moment. I live from my Highest Self which is one with all. When love flows across that bridge, miracles happen. Member of a Soul Group: Every soul belongs to a soul group. A soul group is a group of souls who come from the same soul family and soul origin. Often soul groups reincarnate together on Earth. Sometimes only a part of the group incarnate at the same time. Individuals in the same soul group have the same soul purpose and can have similar feelings, thoughts, and inclinations. When an individual is incarnated with members of their soul group, they feel deeply connected. Soul Mates – Soul mates are souls that have had many lifetimes together. Their purpose is to help each other grow, evolve, and process karma. Soul mates play many different types of roles such as siblings, parents, children, best friends, co-workers, teachers, and romantic partners. Soul mates feel a deep connection through friendship, love, intimacy, and sexuality or they feel intense resistance, loathing, and even hate. A soul can have many soulmates in a lifetime. Soul mate relationships can be brief or they can last for an entire lifetime. Union Souls: These souls were birthed as one but split in half when Atlantis deconstructed. They are seeking to reunify with their other half (twin flame). Union souls experience many marriages over multiple lifetimes. Omni Souls: These souls were birthed as one and have never split. They feel complete without a partner. Omni souls experience temporary relationships. Dual Souls: These souls were birthed as one complete soul but have another counterpart (twin soul). They are whole as individuals yet find greater connection with their counterpart. Dual souls, while looking for their twin, can find earthly fulfillment without their counterpart. Multi-expressional Souls: These souls were birthed as one soul but have the ability and desire to express in many ways. Multi-expressional souls often practice polyamory and may find it difficult to stay in a committed relationship. 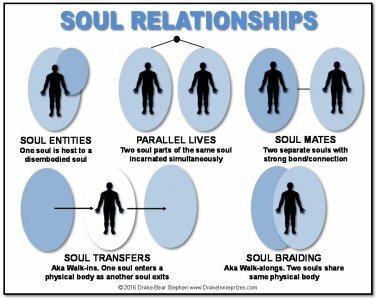 Parallel Souls – Parallel souls, also known as parallel lives, is one soul that is living multiple lives in the 3rd dimension simultaneously. Technically all lives are happening concurrently because in other dimensions, there is no time-space continuum. Time is not linear, it is a frequency. So past, present, and future lives are all happening at once but at different frequencies. A parallel life is two or more lives happening concurrently at the same frequency. 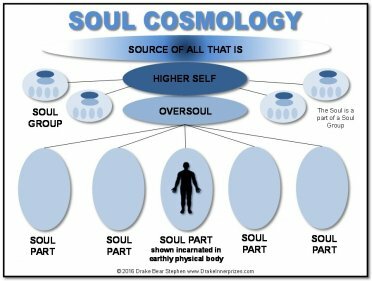 Soul Transfers (Walk-ins) – In this process, a new soul merges into an existing incarnated body and the original soul leaves. This is always done with agreement between the incoming and outgoing souls. The human self may not be aware of this transfer because the agreements are made on the soul level and the incoming soul assumes the memory of the outgoing soul. In addition, the incoming soul agrees to take on the karmic responsibilities of that body’s life. The incoming soul is usually more evolved than the outgoing soul. Many times the soul exchange takes place during a traumatic situation. The advantage to the incoming soul is that they can activate their mission right away instead of waiting for the physical body to grow through infancy and childhood. Soul Braiding (Walk-alongs) – In this process, a new soul merges into an existing incarnated body but the original soul does not leave. This is usually a short term or temporary situation. There are different reasons why a soul may want to “borrow” an existing body such as they may never have been on Earth before and want to test it out or they may come in with special abilities in order to carry out a particular mission. 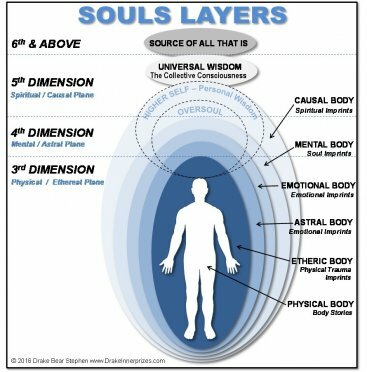 Soul Entities – These disembodied souls have crossed over through the death process but remain in the 4th dimension (the astral plane). This happens if the soul is not ready or willing to “pass through the Light” to the 5th dimension. Instead, they desire to live vicariously through a body that is still incarnated so they attach to a physical/energy body of an incarnated soul. Disembodied souls that become entities can be divided into two categories: the “lost” (souls may not realize they have passed or feel they have left the physical plane with unfulfilled agendas) and the “fallen” (souls that have less than desirable intentions when attaching to an incarnated soul). A host is an incarnated individual who voluntarily shares their body with other souls while retaining their own consciousness and sense of self. Starseeds – These are beings from other planets, star systems, or galaxies. The motivations for starseeds to come to earth are usually to help Earth’s evolutionary transformation. Starseeds have an awareness of galactic consciousness. New starseeds have had few or no previous lifetimes on earth and may have a difficult time adjusting to Earth’s environment. Typical starseeds may have lived 5-50 life times on Earth but retain some of their extraterrestrial abilities. Old soul starseeds have had hundreds of life times on Earth. They are often spiritual teachers, shamans, prophets, light workers, healers, and leaders. Technically speaking, all humans are probably starseeds if their lineage is followed all the way to Source. We have calcium in our bones, iron in our veins, carbon in our souls, and nitrogen in our brains. 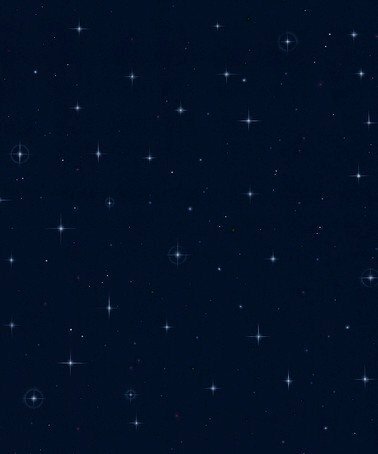 93% stardust, with souls made of flames, we are all just stars that have people names. Wanderers – These beings are souls from other planets or dimensions, who come to Earth with a specific mission. Often this mission is helping prepare humanity for coming changes. After completion of the mission, they return “home”. Technically speaking, all souls are Wanderers because they experience many realities simultaneously. A soul’s ultimate “home” is the return to higher consciousness as sparks of light and the eventual reunion with the Source of All That Is. I now have office space HCH (Hypnotherapy Institute) in Lafayette. 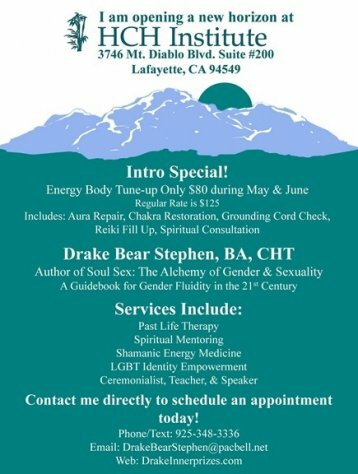 To celebrate, I am offering a special rate of only $80 for energy body tune-ups during May and June. Feel like you need a jump start in your life? 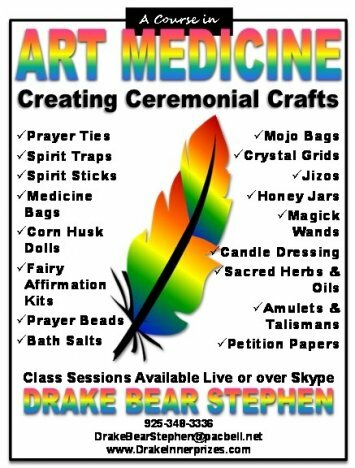 I have developed a new course call Art Medicine. It is the creation, consecration, and maintenance of spirit crafts used for ritual and personal use. Contact me for further details.